Hot-tubs can allow pathogens to grow. Legionella is one that is most commonly associated with hot tubs that are not well managed. We have over the years worked with our hot-tub manufacturer and chemical provider to develop and document a routine to provide a safe and pleasant environment for our guests. We review our procedures regularly in order to ensure that we keep up to date with best practice. 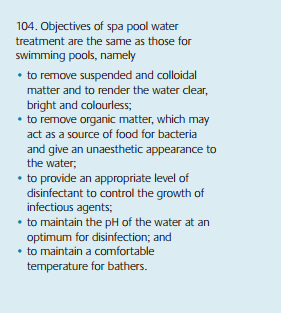 Throughout this section we refer to the guidance provided by the Health and Safety Executive (HSE) in their publication “Management of Spa Pools – controlling the risk of infection”. Change water regularly – we change the water at least once a month and keep a record of when the water was changed. We shock the water on the morning of the changeover. We change the hot-tub filter at each change over. We check rest the chemical balance at the beginning of the day. We check the chemical balance again before guests arrive. We then check the water daily – between 10am and 11am except Sunday when the water checks start at 11am. We inform our guests how to make best use of the hot-tub. We ask guests not to use the hot-tub if the temperature is not displayed on the information panel. We ask guests not to use the tub if the water is not clear. We have adopted best practice recommended by the Health and Safety Executive and will give you a copy of the Hot tub information managers should provide their guests. We use bromine, which is less harsh on the skin than chlorine. Some of the lodges have a floating device, this device houses a couple of bromine tablets, these top up the bromine as it is used. In order to be effective in the control of bacteria in the hot-tub water, we need for you to follow some simple steps. The main pollutant that changes the clarity of the water is soap residue, followed by perspiration, dead skin, sun tan lotion, cosmetics and shampoo. No eating in the tub. 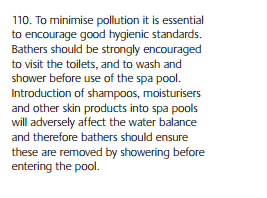 The HSE guidance is no drinking in the hot-tub, largely due to risk of swallowing the water. We advise that if you are going to have a drink, please use plastic tumblers and take care not to swallow the hot-tub water. The water in the hot-tub is maintained at 40oC, that is, 104 oF. Pregnant women are advised to consult their GP. Similarly guests who are suffering from diseases of the heart and circulation, skin conditions, are immunosuppressed, subject to fits, or taking drugs affecting the cardiovascular or nervous systems, should seek medical advice before using a hot-tub. Babies are not permitted in the hot-tub under any circumstances. Our hot-tubs are maintained at a constant temperature of 40 degrees Centigrade equivalent 104 degrees Fahrenheit. The water temperature is too hot for their little bodies. The water in the hot-tub is a lot deeper than appears to the eye. Children four and under four years of age are not permitted in the tub. Children five years or older need to use the hot-tub with adult supervision. Children or others who cannot keep their faces out of water should not use the hot-tub. There is a risk of accidental drowning. People with alcohol, drugs or medication (that can cause drowsiness) in their system should not get into the hot-tub. HSE recommend that the hot-tub is not used after a heavy meal. The hot-tubs we use are designed to be used in 30 minute sessions. Once you have used the tub, if you close the lid, the filtration system will do its work and the tub will ready to use once filtration is complete. Please take care when entering and exiting the hot tub and crossing the decking, as there may be a risk of slipping. Electrical items are not permitted anywhere near the hot tubs as this poses a risk of electrocution. Please do not use the hot-tub if any element is not working and report this to the office. If your hot tub is not responding to the buttons, please switch on/off using mains switch on the wall of your lodge. If there has been a power failure, please reset the temperature on your hot tub to 40oC using the up and down arrows on the hot tub to reset maximum temperature to 40oC.